Nutrient partitioning, also called nutrient timing or meal timing, is the careful scheduling of macronutrient intake to boost weight loss, fat loss, or bodybuilding effects. If you are an athlete who uses this dietary strategy, you plan exactly when to eat carbs, protein, and fat so that you take full advantage of the unique nutritional advantages of each food type. Dieters may use meal timing strategies to help them stick to their eating plan, too. But not all experts agree on the value of nutrient timing for weight loss or weight gain, and the research has provided mixed results. If you are a regular gym-goer, chances are good that you've seen guys in the weight room grab for a protein shake within minutes of finishing their session. Many times the shakes include nutrient partitioning supplements (usually herbal compounds) or other ingredients to boost macronutrient partitioning. The word "partitioning" is used to describe this food timing practice because by scheduling your intake of protein and carbs you may be able to influence where the nutrients are used or "partitioned" in the body. People who practice nutrient timing believe that consuming specific nutrients at specific times helps promote insulin regulation for fat loss and muscle building. For example, you might consume a carbohydrate and protein-rich meal or snack right before exercise or immediately after exercise to increase insulin production. The theory is that by elevating insulin levels you boost glucose uptake in the muscles to build or preserve muscle tissue more effectively and burn stored fat for energy. Some research has suggested that timing your intake of macronutrients may provide these benefits. But there is also research that found no advantages to meal timing. One large review of studies found that while there is evidence to support the timing of protein intake, there is much less evidence to support timing your carbohydrate intake. Researchers concluded "high-quality protein dosed at 0.4–0.5 g/kg of lean body mass at both pre- and post-exercise is a simple, relatively fail-safe general guideline." But they added that when you choose to consume carbs is less important than simply meeting your daily carb intake goals. Carefully monitoring when and what you eat can take a lot of work. For many of us, simply eating a balanced diet is hard. So is it really necessary to practice nutrient timing, as well? The best answer for you may depend on your goals. Many experts say that getting the proper balance of nutrients is more important than specific (and sometimes tedious) food timing practices. Leisan Echols, MS, RDN, CSSD, CSCS, says diet and exercise goals matter and that your current fitness level should matter as well. Echols is an exercise physiologist and registered dietitian nutritionist who helps guests at The BodyHoliday in St. Lucia reach fitness and diet goals. "As a board-certified specialist in sports dietetics, the majority of my clients range from avid exercisers to elite athletes. Achieving optimal body composition, modifying weight (loss or gain), and/or improving performance are typical goals. With that said, for my clients, I feel that timing and absolute daily intake of nutrients are equally important. For inactive individuals, I believe absolute daily intake of nutrients is more important than meal timing." Avid exercisers, performance athletes, and bodybuilders may benefit from the potential benefits provided by the specific timing of nutrient intake. But these are individuals who choose to invest more time and effort into their athletic endeavors. For many of us, however, scheduling the intake of each nutrient is more work than we need to put into our diets. Simply getting the right balance of nutrients at meal time is enough of a challenge. We may be able, however, to benefit from scheduled meal timing, however, if weight loss or healthy weight management is a goal. When you're trying to lose weight and you're following a calorie-controlled diet, timing your food intake may provide benefits. In fact, research has suggested that scheduling your food intake so that you eat more in the morning may provide a small boost. One study of 93 sedentary overweight and obese women with metabolic syndrome found that front-loading calories by eating a larger breakfast and a smaller dinner was more effective for weight loss than backloading calories or eating a smaller breakfast and larger dinner. Women who took part in the study ate 1400 calories per day and maintained a sedentary lifestyle for the duration of the research. 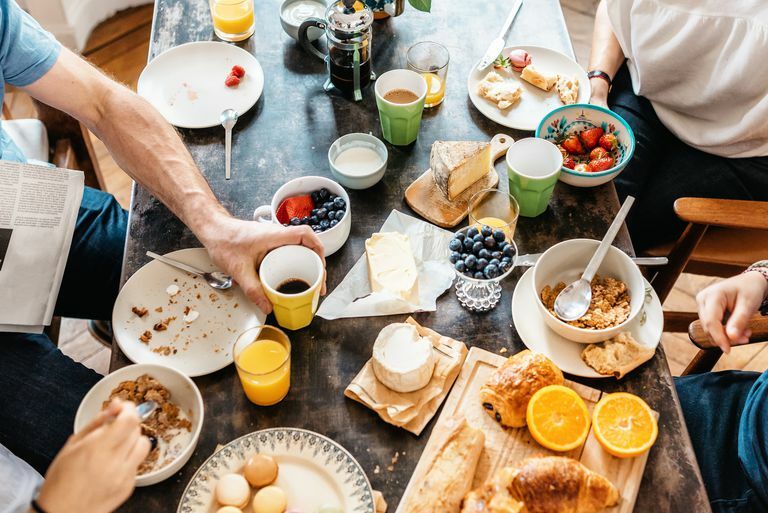 Study authors concluded that "high-calorie breakfast with reduced intake at dinner is beneficial and might be a useful alternative for the management of obesity and metabolic syndrome." Echols has also seen benefits with her weight loss clients who use meal timing. She says that when she creates a specific meal and snack schedule for her clients it provides the guidance they need to be successful. "Having the structure of a meal plan makes eating well less stressful. Not only do (clients) know when to eat, they also know how much and what types of foods to eat to get the right balance of protein, fat, and carbohydrates." Echols adds that there is no perfect meal timing schedule and that your perfect food schedule may be unique. "It depends on the individual and many additional factors," she says. Factors that can come into play include your physical activity level, the type of exercise you participate in, the duration of your physical activity, and even genetics. Specific nutrient timing is a practice that may provide benefits for weight loss and athletic performance, but it is important to remember that the benefits are likely to be minimal. If your goal is weight loss, eating certain foods at certain times won't compensate for a diet that is unbalanced or too high in calories. If your goal is improved athletic performance, nutrient partitioning can't take the place of a consistent, well-designed training program. In short, food timing helps you fine-tune good nutrition, but it doesn't take the place of balanced eating for exercise or weight loss. Garaulet, M et al. “Timing of Food Intake Predicts Weight Loss Effectiveness.” International Journal of Obesity 37.4 (2013): 624–624. Jakubowicz, Daniela et al. “High Caloric Intake at Breakfast Vs. Dinner Differentially Influences Weight Loss of Overweight and Obese Women.” Obesity 21.12 (2013): 2504–2512. Johnston, Jonathan D. “Physiological Responses to Food Intake Throughout the Day.” Nutrition Research Reviews 27.01 (2014): 107–118.